Product #16473 | SKU MMA202 | 0.0 (no ratings yet) Thanks for your rating! The best solution for attaching an iPad Air to a round surface. The MagConnect C-Clamp mount is the best solution for attaching an iPad Air to a round surface. The single carbon fiber arm of the C-Clamp mount reliably mounts your iPad while keeping it nearby. This mount is ideal for warehouse shelving, corporate reception areas, workspaces, and creative organizations. For longer length, try our Tournez Clamp Mount. Attach your iPad Air to a mic stand or camera tripod via the Tournez C-Clamp mount. While keeping your microphone or camera attached, the C-Clamp can attach to the side of the stand to add the tablet to your existing setup. Musicians can read chord charts, use live effects processing, or record directly to the tablet seamlessly. Photo/Video artists will enjoy using their tablet as a large view finder or for quick edits on the go. MagConnect™ mounts are built of high-quality carbon fiber arms. This advanced material is surprisingly lightweight yet incredibly strong. The powerful combination of carbon fiber with carefully designed joints produces mounts that are both easy to maneuver and sturdy to use. MagConnect™ mounts come equipped with spherical joints for ultimate customizability. 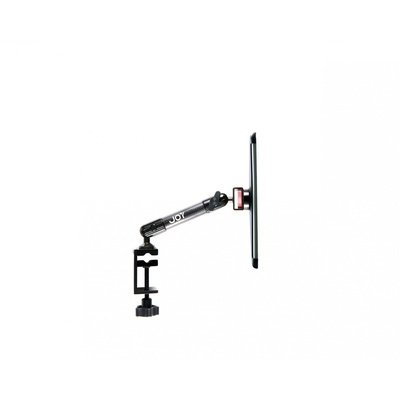 The included MagConnect™ iPad holder can be swiveled 360° to easily transition from portrait to landscape mode without removing it from the mount. And the sturdy carbon fiber arms can also be adjusted into infinite configurations providing you with the perfect angle every time. The MagConnect™ locking mechanism is the next step in the evolution of mobile mounts. The technology is advanced, but using it is quite simple. First, the iPad is secured into a hard-shell case equipped with a powerful magnet. When the case is attached to a compatible product, another magnet instantly interlocks your MagConnect™ shell with a receiver, while a precision screw tightens for a secure fit.